Powers/Abilities: Born with a skull-like face and large, globular eyes Maggie at first didn't display any additional superhuman abilities. Around the time she was eight, she started to realize that with sufficient concentration she could see through solid objects. Over time, as she matured, she used her "x-ray eyes" to help diagnose diseases. (Marvels#2 (fb) - BTS) - Because his daughter was born a mutant, Maggie's father lost his job. No longer able to take care of her, Maggie's parents abandoned her when she was around 7 years old. Forced to fend for herself, she was living in a park when she was found by Jenny and Beth Sheldon. The sisters took the cold and hungry girl home with them and hid her in their basement. (Marvels#2) - News photographer Phil Sheldon noticed his daughters swiping scraps of food from the dinner table. At first, he thought they were secretly feeding a stray dog or cat, while in fact they were feeding Maggie. One night, Phil returned home and saw his neighbors worked into a panic because they spotted Maggie prowling through their neighborhood. Alarmed that mutants now threatened the safety of his home, Phil ran to his house, where he discovered Maggie hiding in the basement. At first intimidated by her inhuman appearance, Phil looked into her tearful eyes and saw her for what she really was -- a sad and frightened little girl rather than a monster. Taking pity on Maggie, the Sheldon family continued to care for her. (Marvels: Eye of the Camera#2 (fb) - BTS) - During her stay with the Sheldons, Phil took several pictures of Maggie and his children. He developed the photos and kept them in a seperate folder at home. 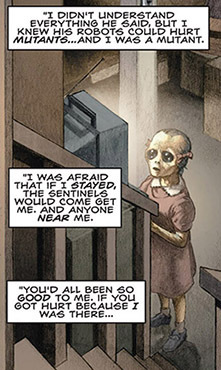 (Marvels#2) - While Maggie was staying with the Sheldons, Bolivar Trask continued to fan the flames of anti-mutant hysteria until riots broke out when he first presented his Sentinels on television. Phil Sheldon was fearful for the safety of his wife and daughters should Maggie be discovered by enraged rioters, but his fears were soonended under tragic circumstances -- not wishing any harm to come to the Sheldons, Maggie had run away, leaving only a farewell note, in which she thanked the Sheldons for their kindness. Saddened by Maggie's sudden departure, and knowing nothing of her fate, the Sheldons could only hope for the best for the forlorn little girl. (Marvels: Eye of the Camera#6 (fb) ) - After leaving the Sheldon's basement, a covered up Maggie made her way to the nearest airport. There, she subconsciously used her mutant powers for the first time, seeing through cargo and freight to avoid the guards. She hopped planes several times, spent time hiding away on a boat and even an extended bustrip. Maggie tried to get away from the world and eventually ended up living with a primitive native tribe in New Guinea. The locals accepted her for who she was and Maggie tried to help them as best she could. After acquiring a short-wave radio, she was able to monitor the news and arrange for shipments of medical supplies and books, setting herself up as the local doctor and teacher. Using comics and newspaper, she taught children how to read. Maggie also used her mutant powers to detect potential physical problems with her patients. Grateful for her aid, the locals hid Maggie when one day a squad of Sentinels flew over the village. Through the years, Maggie kept herself informed about the Sheldons, even sending for Phil's first photo book about the 'Marvels' as he described superheroes. (Marvels: Eye of the Camera#2 (fb) - BTS) - Years later, now suffering from terminal lung cancer, Phil Sheldon went through his photo archive to look for suitable images for his next book. He came across the file containing the snapshots of Maggie, which got him to thinking how afraid he was of her at first. Watching her play with Jenny and Beth made him fear the small girl might infect his children. Phil was comforted by his wife, but he still couldn't forgive himself for not helping keep her safe during the Sentinel riots. (Marvels: Eye of the Camera#6 (fb) - BTS) - When Phil Sheldon's cancer diagnosis became public knowledge, Maggie also heard of it and decided she had to go back and find him to thank him for saving her. (Marvels: Eye of the Camera#5) - Maggie finally made her way to New York City where she learned Phil was at the hospital. Making sure no one saw her, she snuck into his room one night, startling the sleeping photographer who at first mistook the now adult Maggie for his wife Doris. (Marvels: Eye of the Camera#6) - Maggie and Phil had a happy reunion, with Maggie sharing her history with the still stunned Sheldon. She then thanked him for keeping her safe, a notion Phil rejected outright, admitting he was terrified the whole time and even considered turning her in himself. Maggie assured the old, dying man that she considered him her rolemodel, recounting how many times when she had a tough call to make, she'd ask herself "what would Phil Sheldon do?". In a world with X-Men and Avengers, he was her hero. They watched television together for a while, seeing how Phil's old assistant Marcia Hardesty was covering the X-Men fighting an unknown threat in Dallas, eventually even sacrificing their lives to keep mankind safe. Just then, Doris and the girls arrived to see Phil. Unsure what she would say, Maggie was tempted to run away but Sheldon insisted she remained at his side and called his family in to meet their old friend. Doris, Jenny and Beth were amazed and overjoyed to see Maggie and happily reunited, marvelling at how the once frail mutant child had grown. Overjoyed to see his family so happy and reunited, Phil turned off the television in his room to enjoy the scene, realizing that he hadn't done too bad in life after all. Moments later, he quietly passed away. Several days later, a heavily disguised Maggie attended Phil's funeral. After the services, she kept her distance while Phil's friends and colleagues paid their respects to Doris and the girls. However, she joined the family when Jenny Sheldon told publisher Bennett Schwed they would finish her father's book together. Schwed wasn't convinced at first, but when late arrival Marcia Hardesty promised to help them, he agreed. With Phil's legacy secure, Maggie and the Sheldons turned to the coffin that was about to be lowered into the ground and said a last goodbye to their father and friend. Maggie supported the grief stricken Doris as they walked home. Comments: Created by Kurt Busiek (writer), Alex Ross (artist). The events of Maggie's story in the first Marvels miniseries coincided with the stories depicted in Fantastic Four Annual#3 and X-Men I#14. During her stay with the New Guinea tribesmen, she spotted Doctor Doom who had stolen the Silver Surfer's power cosmic, which was a tale told in Fantastic Four I#57 - 60. Her reunion with the Sheldon family occured right around Uncanny X-Men I#226, during the X-Men's televized final stand against the Adversary. Phil Sheldon's funeral service took place around the same time New York City honored X-Factor with a parade for helping save the city from Apocalypse and his Horsemen, a story told in part in Fantastic Four I#312. 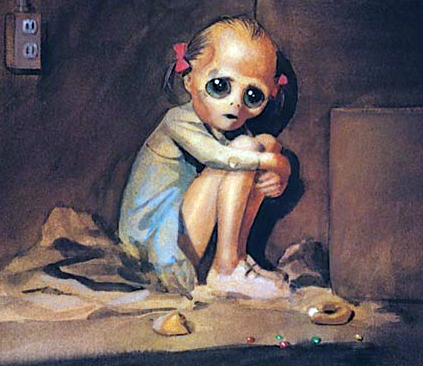 Artist Alex Ross based the look of Maggie on a character from EC Comics' Weird Science I#20 (July-August 1953), from the story "The Loathsome" -- a tale of a young mutant girl pursued by a maddened mob. Profile by John Kaminski, update by Norvo. 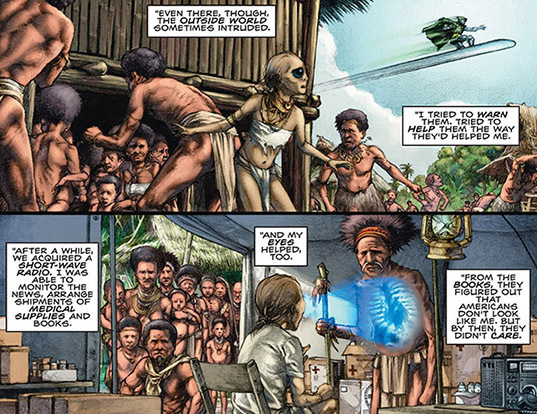 Fleeing from the world that feared and hated her, young American mutant girl Maggie ended up in New Guinea where she was accepted by a local, primitive tribe. Maggie aided the tribe in its continued survival, teaching the children how to read using comics and old newspapers. After acquiring a short-wave radio, she was able to contact the outside world and make regular requests for aid. Thanks to Maggie, the tribe regularly received medical supplies and books. Setting herself up as the village doctor, she used her X-ray vision to help diagnose various diseases. She also made sure they hid away when a power mad Doctor Doom briefly buzzed around the village after having stolen the Silver Surfer's power cosmic. The tribe regarded Maggie as one of their own and even kept her hidden away when a squadron of Sentinels happened to fly over their village. Maggie left the tribe for a while when she learned her personal idol Phil Sheldon was dying of cancer.